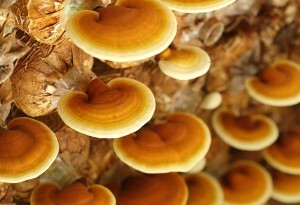 Reishi mushrooms, also known as Lingzhi mushrooms, have been used in Traditional Chinese Medicine for over 2,000 years. Since reishi mushrooms are so nutrient-rich, they contain many healing properties. Reishi mushrooms, also known as Lingzhi mushrooms, have been used in Traditional Chinese Medicine for over 2,000 years. Just like many other mushrooms, reishi mushrooms contain many trace vitamins and minerals including potassium, calcium, phosphorus, magnesium, selenium, iron, zinc, and copper. Since reishi mushrooms are so nutrient-rich, they contain many healing properties. While the proteins in reishi mushrooms contain all the essential amino acids, they are especially rich in lysine and leucine. They also contain a wide variety of bioactive molecules, such as terpenoids, steroids, and phenols. The chemical constituents of terpenes have been found to have anti-inflammatory, antitumor, antioxidant, and hypolipidemic activity. Reishi mushrooms are recognized for their use in blood sugar regulation, cancer disorders, tumors, preventing cancer, fighting viral infections, boosting the immune system, liver protection, increasing cardiovascular function, enhancing vital energy, increasing memory, and antiaging effects. We are beginning to see more supplements and treats for cats and dogs that have garnered the wonderful health benefits of reishi mushrooms. These products offer wonderful protection for the body against free radicals that develop through the regular processes of everyday living, environmental poisons, radiation, excessive fat intake, and processed food. This protection is especially important since our animals are exposed to the same toxins that we come into contact with every day. I Love Dogs Reishi Immune Supplement contains the red reishi mushroom. It is great for dogs with allergies and will also help support skin and cell health. This supplement comes in a tablet form that is easy to hide in a treat for picky dogs. Organic Pet Superfood has three formulas that contain reishi and other mushrooms. These blends are Skin & Coat, Joints, and Immunity. The supplement will last for two months for a 50-pound dog! Animal Essentials MycroTriplex is a liquid tincture of maitake, reishi, and cordyceps. It’s a great alternative to a tablet or powder supplement and may be the easiest supplement to use with cats. With this little bit of information, you can start to understand why mushroom supplements can be so beneficial for our animal’s health and well-being at any stage in life.